Learn How to Draw People and Character Designs Professionally, Drawing for Animation, Comics, Cartoons, Games and More! With over 6500 5-Star reviews, join thousands of Artists in training in the best Character Drawing Course in the world! What is Character Art School? Character Art School is a learn-anywhere video course where you learn how to draw professional characters for books, games, animation, manga, comics and more. I’ve hand-crafted the Character Art School: Complete Character Drawing course to be the only course you need to learn all the core fundamentals and advanced techniques to drawing and sketching characters well. If you’re an absolute beginner or you’re already at an intermediate level, the course will advance your current drawing ability to a professional level. The course is a comprehensive 10 module guided video course, where the only limit to your progression is your determination and engagement in the rewarding assignments. 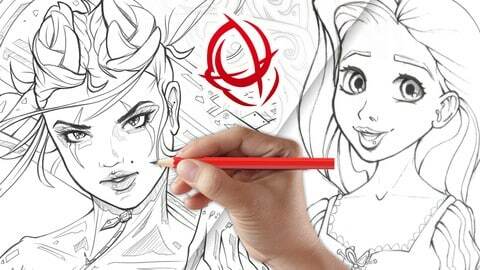 Whether you want to draw character design concept art for films and games, illustrations, comics, manga, Disney style or other styles, this is the course you need to get you there. I’ll teach you to draw without fear, and I’ll teach you to draw well – quickly. Whether you’re a complete beginner, or intermediate at character drawing, you’ll learn things you never knew you never knew. Seriously. Inspired by masters and built on the theory of giants, Character Drawing Academy is one of, if not the most comprehensive character drawing course out there. I’m so convinced of this, I’ll give you a no-questions asked refund if you’re not satisfied. Crystal clear in fact. Learning character drawing and how to draw people effectively means having information presented in a logical and coherent way. The Character Academy Course is modular by design, easy to grasp, and allows you to learn in a well paced, structured way. Engage in the course chronologically, then revise each module at your leisure. Grasp concepts, such as how to draw lips, eyes, faces, and more, faster than you ever have before – there’s no fluff here. Bridging the gap between theory and practice, each module’s assignments have been designed to both reinforce theory, and feel rewarding. I’ve taken the core of the theory, and purpose built each assignment to help you rapidly progress, and you’ll see the difference in your own work almost immediately. Art is about doing, so let’s get started- let’s draw something awesome! Whether you want to learn Character Drawing to draw for games, comics, cartoons, manga, animation and more, this course has you covered. I’m not teaching you a ‘method’ or a ‘way’ to draw, I’m teaching you to be fundamentally good at drawing characters, whether you prefer traditional pencil drawing or draw digitally.